Our guest bedroom is vacant again. For the past three weeks it was occupied by one of my daughter’s closest friends. She moved in upon a recommendation by her premarital counselor in order to mentally and physically focus on preparing for her wedding; to enter into the relationship with a pure and ready heart. Her stay seemed like a mere blip on the radar to my husband and I. She left a note on our kitchen counter yesterday morning, however, that made us think it was much more than that to her. She wrote that her stay was “the best wedding gift she could have received.” I think it gave her a small island of calm amid the blustery last days before the big event. I hope so…a bridal retreat from the traditional countdown chaos doesn’t sound like a bad idea. Earlier this evening, my family and I sat as witnesses while she wed a young man from Germany she met during a high school exchange program several years ago. After we left the wedding, my husband and I ended the day by sitting together in our front yard, watching the cardinals find their final snacks before nightfall and listening to the tree frogs begin their songs. As the night sounds grew louder, my mind played over again a ritual I witnessed after the ceremony. The experience struck me on several levels. May 5, 2011 note: Today I went to the tag agency and while I was waiting on my requests to be processed I heard a man next to me provide his home address to the clerk. I was surprised to hear he lived on “Clover Glen,” the street where Mick and lived in our first home. This has been a week of weird coincidences, so I decided perhaps there was more at stake than just coincidence. Therefore, I’m reposting this entry I wrote almost a year ago in preparation for another I’ve been writing for three days. I’ve been writing, and thinking about, and researching, and writing more about the process of falling in, out, and perhaps…back in love again. The setting was a cold February, 1986. My husband and I had been married about six months when the bottom of the oil bust hit Oklahoma. Thousands of homes in Edmond were being vacated after the interest rates within a group of “negative amortization” loans began to skyrocket as the oil jobs started drying up. I was thinking about this message last week because I was wondering why weddings have been occupying so much of my thinking lately. I didn’t have to wonder too long, however, because my supervisor was right. I’ve been attending weddings because it’s the summer “wedding season” of 2010 and I work at a university populated with students. These students are generally of the age to begin wedding hopes, dreams and plans…and also host or attend wedding ceremonies. Finally, my children are 18 and 23, which means THEIR friends are also thinking about and participating in weddings. I’m immersed. Immersed in “dreamy-hopeful-lovey-cool-fun-startingoutonournewjourney” land. The upside of this immersion is having the chance to observe magical moments at each and every ceremony. This particular story is about magic. The magical power of a network of friends – focused, purposed and amazing. And speaking of being immersed…I’ll begin the story by considering Nemo . “Finding Nemo” was a Disney masterpiece chock-full of important life lessons. The illustration I’d like to highlight is the “SWIM DOWN – KEEP SWIMMING! !” scene. Do you remember it? Nemo and Dory were almost home from Sidney when Dory was scooped up along with a massive school of fish into a fisherman’s net. As the net began an upward ascent, pulled by a hydralic lift aboard the boat, the fish began to panic. That’s when the magic happened. Nemo and his father began spreading the message to all the fish to swim downward. It would only work if they ALL swam together. Here’s a visually rough clip of the scene. I get goosebumps when watching it. Take a look…. Amazing things were accomplished when all the fish focused toward one goal. And ONLY because they planned together (Nemo and his father agreed on the plan) and worked together. Another example? Amazing things were accomplished when hundreds of thousands coallition troops stormed the beaches of Normandy and paratrooped from the sky to turn the tide during WWII. And ONLY because they planned together and worked together. I walked into the church before it began and was met with a visual of thirty or so college aged attendees greeting each other, opening the doors for guests arriving, suggesting to those just arriving that they sign the guest book, walking through the sanctuary of the church and meeting and greeting those seated. The bride and groom’s friends were basically running the ceremony. Although they had the traditional pastor-types leading the ceremony, the fingerprints of the wedding party were everywhere. They sang and accompanied several songs, the groomsmen pulled out matching sunglasses on a particular cue, the bridesmaids walked as if they knew each other and didn’t miss a beat whenever the bride’s dress needed arranging or the flowers needed to be held. Hmm. This group was synchronized like a well oiled support machine. My next observation? After the ceremony, the entire wedding party had exited to music played by their group. As I stood up to leave the sanctuary something caught my eye. In a flash, the bridesmaids came back into the emptying auditorium and began to spread out. They had a purpose but I didn’t yet understand what they were doing. I watched with intrigue as they began to quickly pick up all the wedding flower decorations, speak with the groomsmen who were tearing down the musical equipment authoritatively, talk with each other about “who cleaned out the dressings rooms and did they do a final check on all the lights,” and other efficient and responsible dialogue. The groom’s friends DJ’d the party. The bride’s friends escorted her outside when she got hot, and responded to the groom’s request of a drink for his bride. The group danced with the groom’s grandfather, they danced together, and they danced with each other. And, every time I turned around, one of them was talking to another guest – engaged in a genuine conversation and getting to know someone they had only met that night. 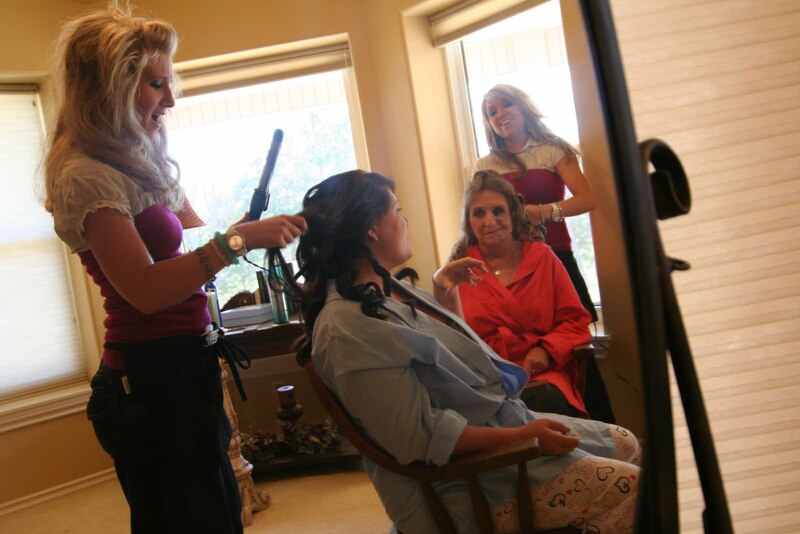 HERE IS A SHOT OF THE BRIDE AND HER MOTHER GETTING THEIR HAIR AND MAKEUP DONE BY TWO OF “THE GROUP.” ELISSA’S MOTHER HAS RHOMBERG’S DISEASE AND GETTING A MAKEOVER WAS A SPECIAL TREAT. ELISSA SHARED WITH ME THAT THIS WAS ONE OF HER FAVORITE SHOTS OF THE WEDDING…SHE AND HER MOM TOGETHER, GETTING READY WITH THE SUPPORT OF HER FRIENDS. When you need support, we’re here. When you need diversity and creativity, we’re here. We were beside you when you were married, so we’re in this together. You’re worth our time and attention. We believe in you, your marriage and your future. 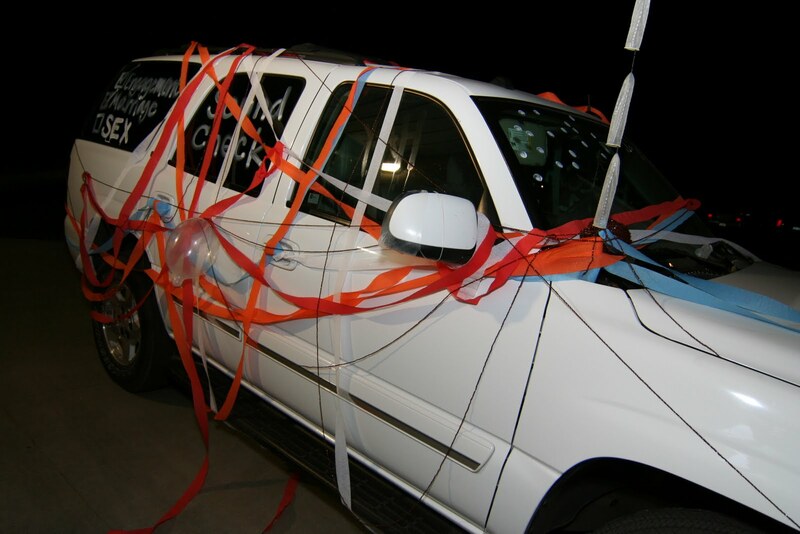 When a group “blesses” a wedding, it’s a powerful thing. I would say it’s magic. And in this particular case, it was the mind-numbing magical power of the “sistah and bro-hood” wedding planners extraordinaire. They were there when it started and I have a sneaking suspicion that when Elissa and Ryan celebrate their 50th wedding anniversary, they will already know who to call to plan their party.